Over the last century, experts have written on many commonalities between Buddhism and modern Western philosophy. The main area of overlap between these two traditions is Buddhist ethics, so that it is almost indistinguishable from Western secular ethics and in most part, has nothing to do with traditional Buddhist morality. 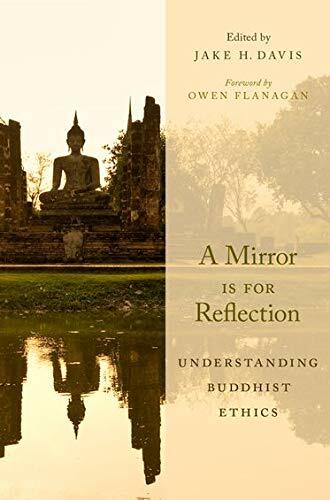 As Owen Flanagan in hisForeword aptly asserts “Buddhism presents a paradox” since, on the one hand, Buddhists are seen in popular imagination as good and having high standards of moral excellence. On the other hand, Buddhism doesn’t theorize ethics in anything like the systematic way that it is theorized in popular western traditions, both secular and sacred. This splendid volume on Buddhist Ethics takes on this paradox and responds to two pressing concerns. One is to understand what exactly the nature of Buddhist ethics is. The second one is to explore what sort of resources for living good human lives Buddhism provides to denizens of Western culture, who are industrialized, rich, democratic peoples. There are some modern interpretations, which propose extensive parallels between the suggestions for living found in Buddhist texts, with their focus on nibbäna (peaceful state of mind by freeing oneself from desires, and the teleological conception of virtue found in the works of Aristotle in particular, with their focus on eudaemonia. Yet, some others argue that the project of fitting Buddhist ethical thought into Western philosophical categories may be a very limited utility; and this point of view has shifted considerably the focus of investigations. Davis, in this volume, carefully collected papers from the renowned researchers in the field to offer a snapshot of the present state of the investigation into the nature of Buddhist ethics. In order to do this, he organized the book in six parts, starting first with the debate on Buddhist ethics and Western categories and then in the following chapters expanding on the nature of Buddhist ethics with the collection of papers focused on one or another particular problem in understanding Buddhist ethics in the narrow way necessary for rigorous investigation. The first paper in the part I, written by Damien Keown, who in his landmark monograph in 1992 The Nature of Buddhist Ethics suggested extensive parallels between Buddhist ethics and especially Aristotelian ethics, departs substantially from his earlier project of comparing Buddhists with Aristotelian ethics. İnstead, as the title of his paper “It’s Ethics Jim, but Not as We Know It” suggests, he argues that Buddhist thought lacks the sort of moral theorizing found in Western meta-ethical systems, and consequently it cannot be compared directly to those Western ethical theories. In “The Nature of a Buddhist Path”, B. Finnigan offers a rigorous demonstration of the philosophical complexities that prevent an easy solution to the question of how to fit Buddhist ethics into Western philosophical categories. The last paper in the first part “Buddhist Moral Thought and Western Moral Philosophy” by C. W. Gowans, is about some of the difficulties with virtue-theoretic and consequentialist interpretative approaches. Gowans suggests that Indian Buddhist thinkers are best understood as holding moral theorizing to be mainly unimportant to the practical goals of Buddhist traditions, including living ethically and achieving enlightenment. Part II focuses on constructing Buddhist ethics by pointing out the contributions inspired by and derived from Buddhist ethics to contemporary concerns. J. Park, in his paper “Zen Buddhism and the Space of Ethics”, develops an approach rooted in the nonduality of the Zen and Huayan traditions of Buddhist thought and proposes that an awareness of the tensions between an ultimate perspective on emptiness and the phenomenal level of difference and distinction can open a fertile space for ethical reflection and moral cultivation. G. Priest also develops an approach that draws out the ethical implications for nonself and emptiness in “”Buddhist Ethics: A Perspective”. C. Coseru, on the other hand, up against these constructive approaches, offers a critique of the modern program of Buddhist neuroethics, with its emphasis on both compassion and empirical paradigms of knowledge. Rest of the chapters devoted to offer more constructive approaches for Buddhist ethics developed for con temporary cultural context. Part III starts with the examination of concepts of karma and rebirth. Charles Goodman’s contribution to this section on karma and rebirth sets out from the premise that in the context of scientific worldviews, traditional Buddhist conceptions of karma are giving way to new conceptions that focus not on consequences in future lives but rather on psychological consequences in a single life. Ian Westerhoff in “Buddhism Without Reincarnation? Examining the Prospects of a ‘Naturalized’ Buddhism” raises a powerful objection to such naturalistic approaches to Buddhist ethics by arguing that if there is no continuity of min d after the decay of the body, then the most effective way to put an end to one’s suffering would be suicide rather than the development of ethical behavior, concentration and wisdom advocated in Buddhist ethics. Sallie King focuses on how the notion of suffering as karmic desert can be used to rationalize unjust institutions in his paper “The problems and Promise of Karma from a Engaged Buddhist Perspective” by taking a practical approach to the question of karma in the modern social context. Part IV consists of papers on mindfulness, memory and virtue. Sara McClint in her paper “Ethical Reading and Ethics of Forgetting and Remembering”, offers a rich account on how an ethical reading can impact a reader’s remembrance of the fact that one has forgotten most of the formative actions that have brought one to one’s current situation. Jay Garfield in “Mindfulness and Ethics: Attention, Virtue and Perfection” focuses on training in mindfulness as a central contribution that Buddhist traditions can make to contemporary investigations of moral psychology, and to the field of cognitive science more generally. The last paper, “When You Know for Yourself: Mindfulness, wisdom and Qualities of Heart” written by the editor Jake Davis on this part, brings together two themes in Buddhist ethics: the emphasis on mindfulness as foundational to wisdom and the ethical focus on emotional motivations such as hatred and love that give rise to intention to act. Part V collects papers on intention and action. Karin Meyers in her rich exegetical work on Vasubandhu’s analysis of intention, demonstrates how Vasubandhu rejects in his own historical context both the overpsychologization of intention that is characteristic of many modern interpretations of Buddhist ethics and also the opposite objective extreme, represented by a Buddhist school that attribute ethical qualities to physical entities. In the following paper “What Do Buddhists Think About Free Will?” Riccardo Repetti argues that Buddhist traditions contain the philosophical resources to enrich the philosophical discussion of free will against some recent theorists that suggest that Buddhist understanding of nonself is opposed to Western notion of free will. In a similar vein, Mark Siderits in his paper “Buddhist Reductionist Action Theory” aims to show how Buddhist analyses of action without an agent might prove a resource for contemporary philosophical theories of action. The last part is about politics, anger and equanimity. In his contribution, “The Inherent Dignity of Empty Persons”, to Part VI, Christopher Kelley engages Buddhist philosophical approaches to the self with a practical, pressing political issue. He focuses on the apparent contradiction between Dalai Lama’s philosophical views on selflessness and emptiness, and his endorsement of human rights law, and resolves this tension by suggesting that the doctrine of emptiness, as it is employed in Madhyamaka philosophy of the Dalai Lama’s Tibetan Buddhist tradition, can offer a better philosophical basis for conceptions of human rights. Amber Carpenter in her paper “Ethics Without Justice: Eliminating the Roots of Resentment” takes up the relationship of nonself to the political and the emotional issue of justice. Emily Mac Rae’s paper “Equanimity in Relationship: Responding to Moral Ugliness” closes the volume with a very practical analysis of equanimity’s role and value in manifesting the attitudes of friendliness, compassion and symphatetic joy that are central Buddhist values. This volume offers a rich panoply of ways of approaching the vast and deep set of questions and issues that arise when we explore the nature of Buddhist ethics as well as the relations between Buddhist traditions and Western ethical theories. A Mirror Is For Reflection presents important new research on cutting-edge philosophical and textual topics, including contributions from many of the leading figures in the field. I think this is a very useful collection of essays for the researchers and academicians in philosophy and religious studies. I heartily recommend it as both a valuable tool for classroom use to facilitate discussions for the case for and against the approach, the various ways it might play out, and its possible implications for other issues in philosophy of ethics and Buddhist ethical approaches, and also for initiating further research in related fields. Kamuran Elbeyoğlu (Prof. Dr.), Toros University, School of Business Administration and Social Sciences, Department of Psychology, Yenisehir, 33140 Mersin, Turkey.